Work has been getting me down lately and I haven’t been the funnest person to hang out with either. Today at the Twin Cities Lunch and Learn I was reminded of how lucky I am to be alive. That not many women survive a pulmonary embolism and a stroke. That I unlike the people I work for have something to celebrate. Each day that I am standing above ground is a reminder that I am doing all right. I walked into the Marriott feeling a little out of sorts and was quickly cheered up by the hundreds of women I met. Familiar faces received hugs and high fives, hell I gave out hugs to people I just met. (I am a huger) Nothing, not even work was going to ruin the event for me. The room was filled with contagious energy and it empowered me. 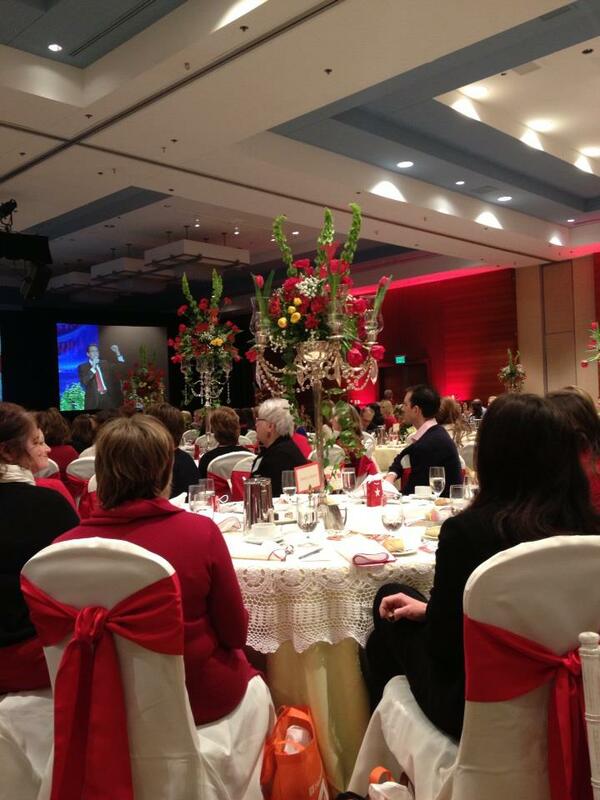 Soon I was all smiles, greeting women, and handing out information at the AHA table. I was able to connect with survivors over stress balls and share my story with those who support us. It was funny when the Merck reps walked by and they over heard me talking about my stroke. A gentlemen asked me “What caused your stroke?” With a sly smile I replied “Well, Sir your product did.” He gave me the craziest look and I repeated my self “Sir the ____ ring did. It’s funny how Merck supports women and then turns around and manufactures a product that almost kills them.” He took his stress ball and slowly backed away from me. I even got to meet one of my Father’s nurses from the Mayo clinic. I thanked her for helping my Daddy get better, because of women like Katherine he survived and he will be celebrating his 11th heart anniversary. It brought tears to her eyes. She said to me “I always remember my patients who come in, in the roughest shape and somehow they walk out a few weeks later on their own.” I told her that he is alive, is doing well, and that he is one extremely proud Grandfather. The Mayo clinic will always have a special place in my heart, for they gave me my father back. I am going Red because no woman should fight alone. Survivorship can be a long and lonely road. When you are young, you never think “I am going to have heart disease, a stroke or even a heart attack. You live your life, work your job, and love your family with all your heart. Until the day comes where something isn’t right and your gut is yelling for you to see a doctor. In that moment whether it be in an operating room, ER, or clinic your world comes crashing down. You stop breathe deep, cry a little, put your big girl pants on, and you walk right into survivorhood with a smile. We are women and we breathe life into every step we take. None of us deserve to fight alone. Together we can take on the world and one day our world will be free of heart disease. Each one of us has a story to share. Heart disease knows no bounds and it can touch anyone of us at any time. My family got involved because of Emma, I jumped my little heart out, learned CPR, and because of my Father my dedication to the cause was strengthened. I never thought in a million years that I would be the very survivor I was advocating for. So the next time you look into the eyes of a woman realize that her heart has bruises and that she was touched by heart disease. I had an easy road, I am proof that early intervention works. Every second counts when you are having a stroke. Every second becomes the difference between living and dying. I was lucky I had mine in the perfect place, I had my stroke right in the ER. I thank my lucky stars that I am alive and I fight like hell for those who lost their lives. Those women paid the ultimate price and because of them I live my life with purpose. On February 1st I am going RED for: Emma Beaulieu, my niece Sophia, my sister JammieLeigh, my Mama, my Daddy, my dear friend and mentor Gerry Nolting, and mostly for all of the women whose lives were cut short by heart disease. Together we can make a difference, together we can save lives, and change the world. Won’t you join us?